With the weather finally breaking, i find i can keep a little busier. Helps stave off depression. I think whenever i start getting down ill just make a sign for practice. Pallet wood is around here. I just carved up 2 custom sign orders, I hope more come in. 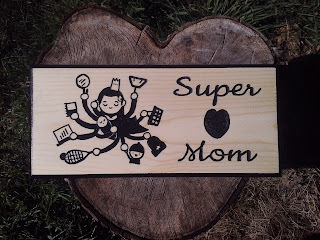 I also made a Mother's Day sign i am hoping will sell, etsy is pretty good on holidays im guessing. I might try putting up a seperate site/blog for my signs. Etsy is great but the fees are less through square if i can make a direct sale through that. Also be nice to have a portfolio of all my work, not just item listings. So people can get an idea for custom orders. Possible fix for the van?